This guide contains basic resources that will greatly benefit LEAP participants. 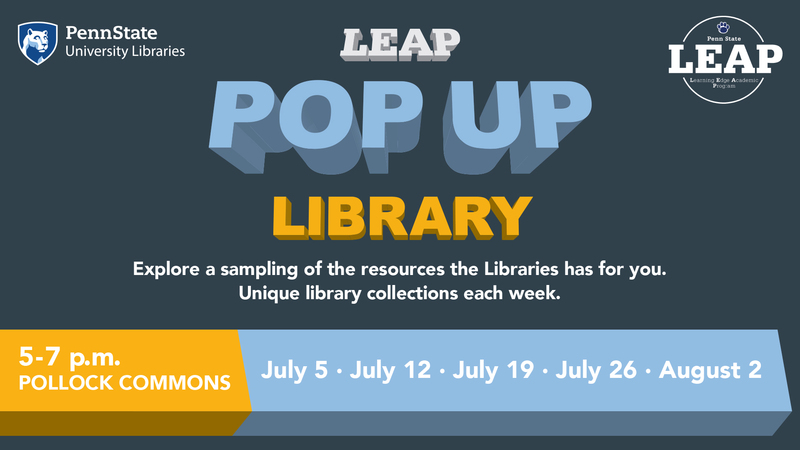 Join us in Pollock Commons each week to discover new and exciting library resources. Each week we'll have our popular leisure reading and leisure viewing items available for checkout. 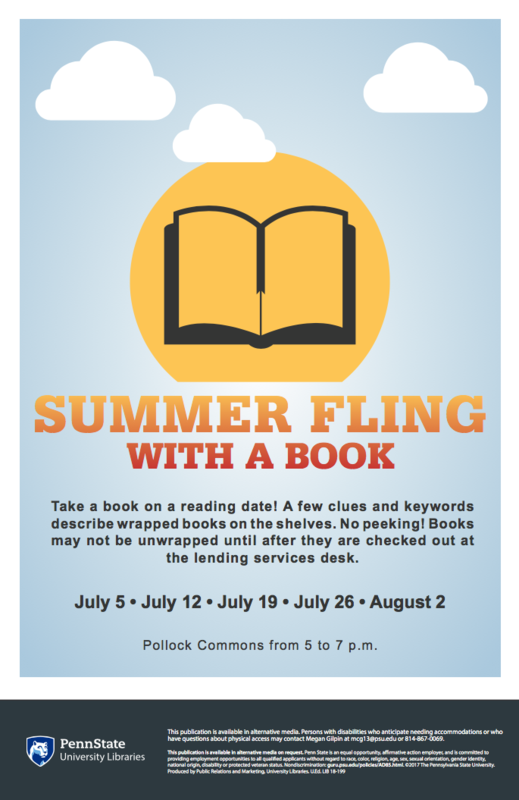 If you want a surprise, we will also have "summer fling" books available for checkout. 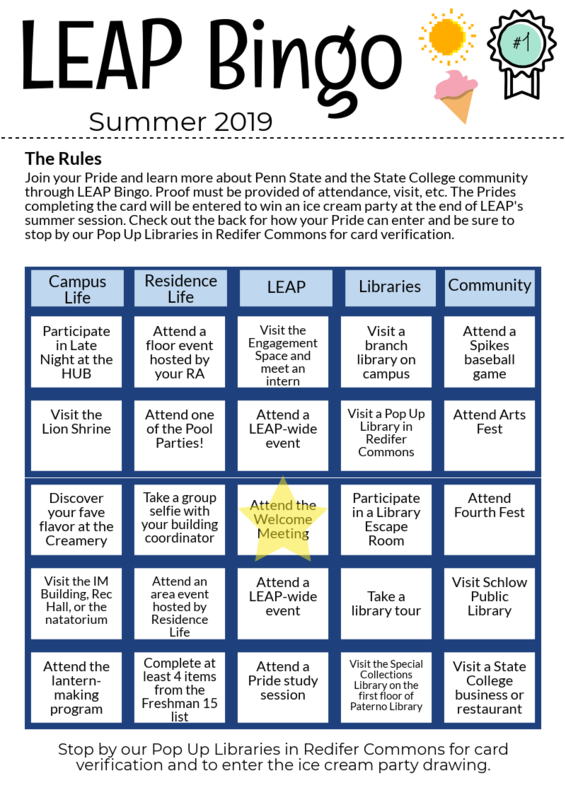 Finally, you can bring your LEAP Bingo Card to any Pop-Up Library for card verification, to pick up prizes, and enter the Bookstore gift card drawing! See more details about the Bingo card below. Learn more about the people, places, and things to do on and off campus! See how many Bingos you can get and your pride might win a free pizza party at the end of the summer! The cornerstone of the Pattee Library is missing. Dismayed at the lack of appreciation for all his great grandfather has done for Penn State, Fred Lewis Pattee the IV has taken it. He will only return it to the person or persons who can successfully follow the clues, proving their appreciation of his great-grandfather and what he meant to the history of the university. A villain has broken into our Special Collections and stolen one-of-a-kind letters written by or for Evan Pugh, our first University President. Without these pages, Penn State can't exist! The villain has left a trail of clues throughout the Pattee & Paterno Library. Solve the puzzles to locate the clues that will lead you to the missing documents. Want to find the Pattee Library's cornerstone? Curious to know where Pugh's missing documents are? Sign up for an Escape Experience for your pride by contacting Megan or Hailley! Questions? Contact Megan Gilpin (mcg13@psu.edu) or Hailley Fargo (hmf14@psu.edu).